During the last DC VMUG, I mentioned the VMware Mobile Knowledge Portal app. There was quite a bit of interest, so I thought that I would link to it here. The VMware Mobile Knowledge Portal app provides access to VMware published content, and other rich media. You can use this application to watch a growing list of view helpful demos, installation/how-to videos, read product whitepapers, and benefit from expert advice. Content can be pulled down for off-line access so you can view on your commute or while waiting around for installations to complete (content > progress bars). 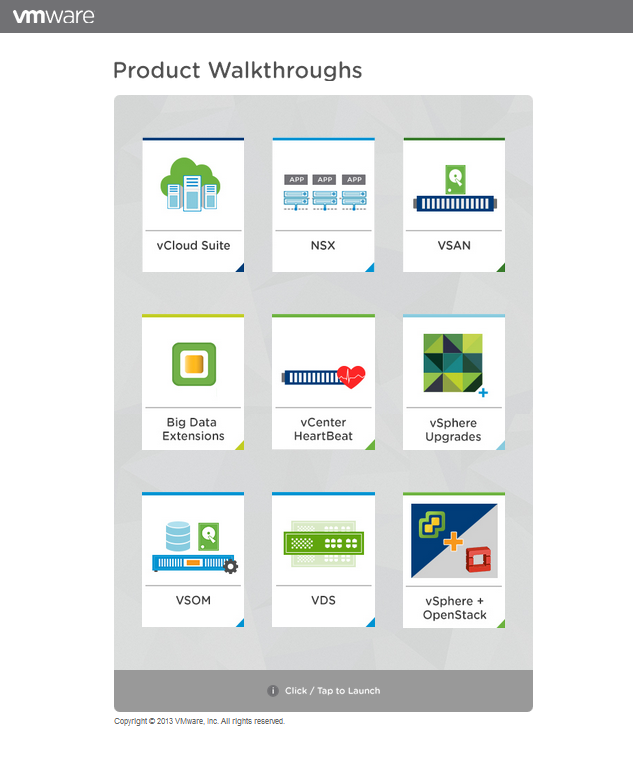 The VMware Product Walkthroughs (PWT) page at http://featurewalkthrough.vmware.com/. The PWT site contains a ton of content that walk you through VMware products from high-level concepts to basic procedures designed to get you ready to deploy products in Proof of Concept environments quickly. The VMware Hands on Labs (HOL) at http://hol.vmware.com/. These are the same labs that are delivered at VMworld, accessible to anyone, anywhere, any time. The HOLs give you stick time with VMware products, walking through installation and configuration, as well as various use case scenarios with multiple products. The HOLs have proved popular with many folks; in face, HOL stats for 2013 include: 39 unique lab topics with a combined 207 lab modules. There were 113,000 labs delivered in the 2013 season amounting to 4.3 million minutes of lab time. I’m on the VMware Technical Marketing team responsible for maintaining these resources, so if you have any feedback feel free to reach out. You can get to me through social media or any of the contact methods I have here: http://vmtoday.com/contact/.